At-Taqwa Mosque built since the 80's are on the road Sriwijaya Kebayoran Baru South Jakarta. For over 25 years the tower and dome of the mosque has not been cleared, as they are not getting a practical way, until in December 2012 the mosque was clean of dirt covered with domes and minarets are white ceramic. 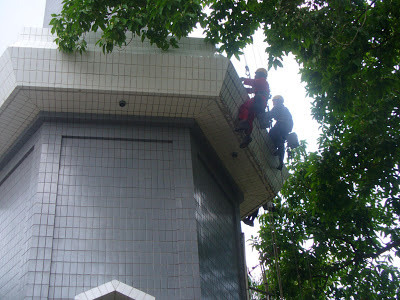 Using rope access system that is practical and fast, cleaning ceramic At-Taqwa mosque can be resolved easily. GOLING ALIENS. Simple theme. Powered by Blogger.